Warehouse premises on Rekendyke Industrial Estate, South Shields have undergone a transformation as BST Fabrics Ltd complete a new 10 year lease to take the whole of Block 7. 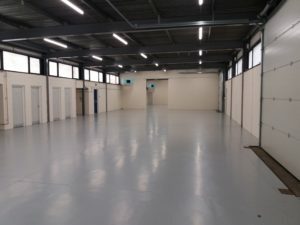 The property which had been occupied by Peter Johnson Funerals Ltd for the past 15 years became available in August 2018 on the expiration of their lease. 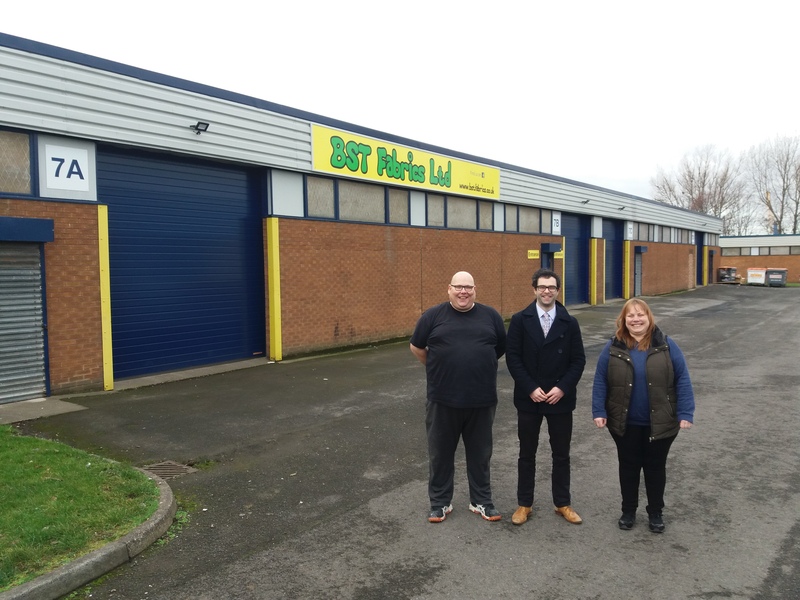 Following an entire refurbishment of the 6,775 sq ft unit a new lease was secured with BST Fabrics Ltd, who have moved from nearby Middlefields Industrial Estate. 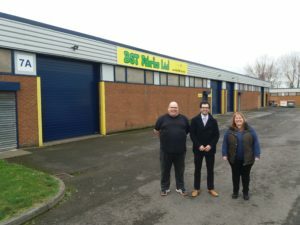 Whittle Jones Welcome BST Fabrics to Rekendyke Industrial Estate”; from left to right: Gary Pickering, Director at BST Fabrics, Angus Todd, Management Surveyor at Whittle Jones; Tracy Akinrogunde of BST Fabrics. BST Fabrics provide a varied range of fabrics including hessian, jute, calico, silks and now have room to offer many more. The fabrics can be purchased at their new unit on Rekendyke Industrial Estate or directly from their website www.bstfabrics.co.uk. Gary and Tracy also run Facebook live events for their keenest of followers. Gary Pickering, Director of BST Fabrics said “Whittle Jones have been superb in helping provide us with a platform to expand our business, the flexibility they can offer to a growing business such as ours sets them ahead of other business space providers and coupled with their helpful ‘can do attitude’ this has helped us outperform our targets over the last 3 years.